Although “Hard Rock” (that's the terminology the band itself uses) act Circle 7 only showed itself on the San Diego scene a mere couple of years ago, the core of the band, in the form of drummer Daniel Cease and lead guitarist/ backing singer Ryan Holliday, have been “at it” for much longer than that. In fact, the twosome have been writing music together ever since meeting at high school and making bonds of friendship, going through several bands and project throughout the years. Some of those had potential, but apparently always lacked cohesion in the personal ànd musical compatibility. All of that changed when in 2006 the twosome found second guitarist Isaac Rauscher and bassist Ryan Welcher, with whom everything really clicked. So Six Reasons was formed, and the band released its album Uninvited Life in 2009, which garnered the band quite some shows, some radio play, and eventually even caused the band to get noticed in the local and regional scenes, with a nomination in the 2007 San Diego Music Awards to boot! Then, although things were moving in a positive direction, the band decided “...to take a step back, and see how they could take their sound and style to another level.” Essentially, that meant auditioning and getting a new lead singer...a process which took the band almost a year, during which the guys also wrote music with a new focus. At the end of the ride the band found Simon Alcantara (whom hails from Venezuela...from all places), and the line-up was finally complete. With their new musical direction and new singer, the band felt a name change was warranted, and Circle 7 was borne! Following the integration of their singer (and his lyrical contribution to the songs), the band did some shows, and eventually started the recording process of this here 11-track album, which took from May 2011 to January 2012, after which the album was mixed in a collaboration between Holliday and recording engineer Michael Kiner at San Diego's Bay Park Audio studio (where also the recordings happened). The results were then sent to Roger Seibel for mastering at SAE Mastering. Now, you may have noticed in the first paragraph, that I have a slight problem with the band's branding of itself as a Hard Rock band? Well, that's because, in their own admission, the band actually blends its many diverse influences into their sound, which is a hybrid of “...heaviness, groove and melody...” (again, the band's own words) which is closer to Grunge than the band possibly wants to admit. However, there's definitely truth in the band's claim that their music “...will have an immediate and lasting emotional impact on their listeners”...in fact, proof of that has already exhibited itself in several positive responses. Circle 7 was the official band of the San Diego May Ride to honor the US military, the band won the East County Throwdown competition, it was a San Diego Music Awards nominee in the category “Best Hard Rock”, it was voted “Best Hard Rock Band” by listeners of the Rock 105.3 radio...and the band succeeded in playing support to Godsmack! Ah...well, how's that for a comparison? I mean, I certainly hear similarities there! Perhaps this band is overall geared toward calmer, down-paced groove, and the singers have different vocal signatures...but otherwize I claim that Godsmack must've felt an urge in their belly to out-do Circle 7, after the smashing opening show the latter did for them! Whatever...personally I'm not that much into this kind of more commercially geared music, but I'm not about to dismiss the positive effectiveness of the band's tunes either! Oh, and there's of course a “softer” side to the band as well (can't go that commercial way without showing some sensitivities), displayed on the album through the title track ballad (which of course includes acoustic guitar interludes – at least the band didn't include any “strings”!). In short, anyone in the more commercial Post-Grunge “Hard Rock” styles, should check out this band for sure. Links: (www.) circle7band.com, (www) reverbnation.com/circle7band, and (www.) 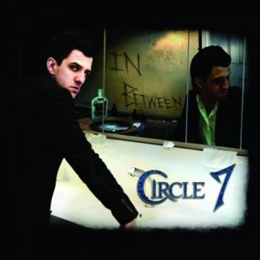 facebook.com/circle7band.